RUNNING WITH SCISSORS, so funny it's dangerous! 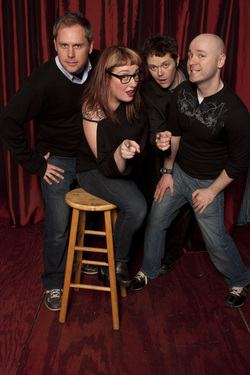 With over 35 years of collective improv comedy experience, Running with Scissors is Maine's premier improv comedy group. In the style of "Whose Line is it Anyway?" Rachel Flehinger, Dennis Hunt, Tom Walsh and Tuck Tucker create a new show every time based on audience suggestions. Perfect for corporate events, private parties, or a night on the town, a Running with Scissors show can be tailored to fit the needs of the audience. Members (or the whole group) are also available to MC your events! Are you strong enough to face RUNNING WITH SCISSORS? Come see their show and find out for yourself.